It’s Blog Hop time & I managed to catch the train on this one! This Litha Hop celebrates the contest between the Oak King, Cernunnos, the Green Man & his “Tanist”, or chosen replacement, Lugh, the Holly King, or Red God. She also points out that this is two aspect of the same being, just in two guises. So we’re asked to find the two faces & then reconcile them this Litha. 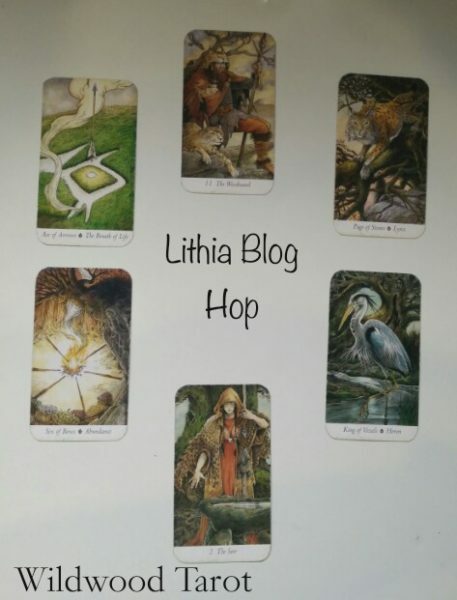 She then asked us to do 3 main things with this Litha Blog Hop. The first was to pick out my “significator”. With this deck, well, that was fairly easy. This is how I see myself when I’m reading the cards. 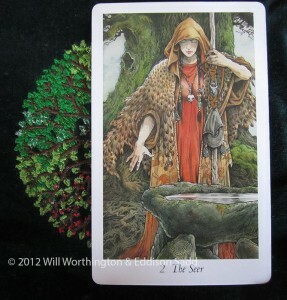 In typical Aisling style, I need to explain to you now why I see myself as this card. In truth, I do try to do this, but I’m human after all. However, when I’m reading the cards, I’m the one being objective, the one that says what’s in the cards (that may already be going through your head). I say the unspoken words, that is after all, why you’ve come to see me. She’s also about giving you options, the possible paths that you can take. That is what I believe this Seer sees in that cauldron of hers. Of course, we can’t see the path before us, all we see is how bad it can be & how hard it can be. To combat The Seer, the “other” side of her is The Woodward. He’s more than Strength, he’s the emotional backstop when fate or the situation is beyond that of normal hope. The Woodward is beyond the state of limbo, he’s been stripped of any emotional baggage that may hold sway over you. He’s free, the same as that Lynx is. He can come & go as he pleases. He’s a balance between the energy of The Hunter & The Guardian, he’s the protection & inspiration. It’s not easy balancing life, we have to find the courage within ourselves. 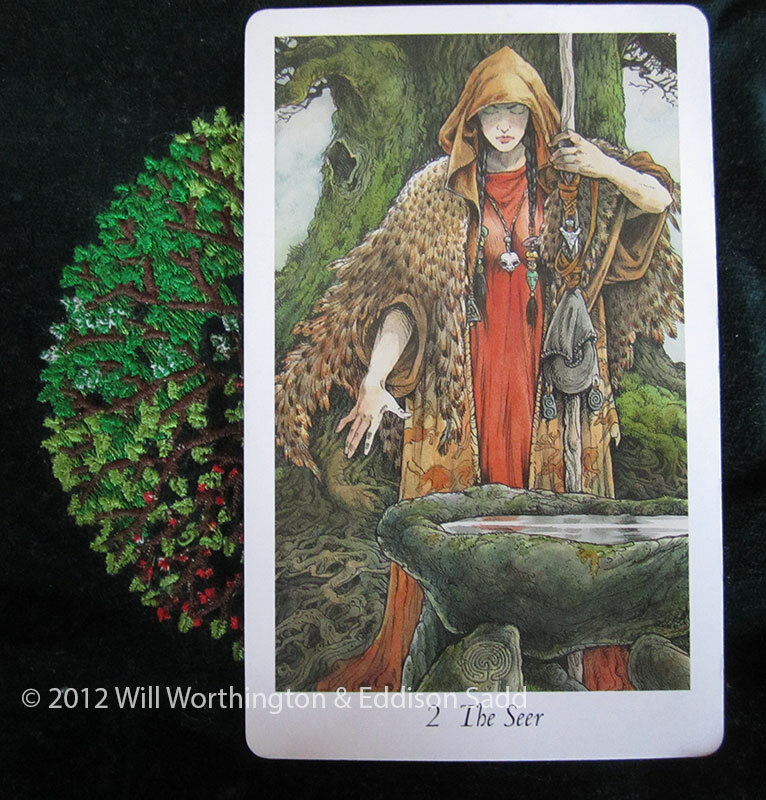 The Seer isn’t one for being strong within ourselves physically, she’s more the mental one. This fellow, you can see is strong. You’d take his word as it came out of his mouth. This card suggests that I keep it simple, don’t over-complicate things. Let the simple things help tie the two facets of this pairing together. Don’t ask for too much from others, or expect it from yourself. The Seer is quite passive, the Woodward isn’t. I sense that she’s happy to “hand things” over to The Woodward at this time of the year. Enjoy the abundance that I’ve created. It’s not often I get to sit & just “be” with nature, with the kids. There’s always something that needs doing. I’m getting better at just enjoying it, but that doesn’t mean that there’s no more work to get done! I’m just being told to enjoy it. The Page of Stones says watch, observe, take hints, take it slowly. You can observe the differences, embrace it but you don’t have to act on it if I do not want to! The power is mine to embrace. Notice that this is the second time the Lynx has come out? I’m loving this quiet big cat. The King of Vessels comes to help out. Most people don’t like him, but I rather do understand him here. He’ll move on if conditions aren’t to his liking, he trusts his judgement. His message here is; trust my own. There are a lot of elements at play here (it was set that we addressed each element) and I have advice from each quarter. Keep it simple, enjoy the moments, watch & observe, then take action if I am happy to. Thank you for reading & enjoy the next hop! The Woodward and the Seer are perfect opposites. I enjoyed this!